At the end, Saiyedna saheb (tus) bestowed Hadiyah and Certificate to all Farzand-Dukhtar and reiterated to offer Namaaz in Masjid regularly, timely and whole-heartedly to protect the sanctity of Misaaq. 24th-25th Rajab ul-Murajjab 1437, Saturday and Sunday morning at 9:30 Devdi Mubaarak at Badri Mohalla witnessed the Josh and Kamaaliyat of Imaan and the pure intention to follow the Sunnat of Allaah Ta’aala i.e. giving bay’at to Da’i uz-Zamaan (tus) who is the representative and Naa’ib of Imaam uz-Zamaan (as). 43 farzando-dukhtaro who has attained the age of puberty called as Sinn-e-Buloogh came with their parents and relatives in the Hazrat-e-Haatemiyah of 45th Da’i ul-Mutlaq Haatim ul Khayraat and Rabee’ ul Barakaat Abu Sa’eed il Khayr Haatim Zakiyuddin saheb (tus) to offer Misaaq and become a member of Isma’ili Taiyebi Da’wat. Rajab ul-Asab is the month of Birth of Maulaana 'Ali (as) in the Ka'batullaah. In other words it is the Birth of Imaan in the Ka'batullaah. One of the basic Aqeedah of Isma'ili Taiyebi mumineen is giving Misaaq or Oath of Allegiance to the Spiritual Leader. The Sajadah (prostration) done by the Angels of Allaah (Malaaik) to Maulaana Aadam (as) was a Misaaq of his Obedience and of his 'Ilm bestowed by Allaah. Maulaana Aadam (as) was superior to the Angels of Allaah because of his 'Ilm. This Sunnah continued during the times of the respective Prophets of Allaah till the time of Rasoolullaah (saws). During the farewell Hajj, Rasoolullaah (saws) took Oath of the people to consider Maulaana 'Ali (as) next to him after his death. Misaaq is followed since the time of Aimmat Faatemiyeen (as) and Du'aat ul-Mutlaqeen (aq) as it was during the time of Ambeyaa (as). Since Maulaana 'Ali (as) was born on 13th Rajab ul-Asab, this month is considered as most revered and auspicious. Every year Boys and Girls who have attained adolesence gives Misaaq of Imaam uz-Zamaan (as) to Da'i uz-Zamaan (tus). 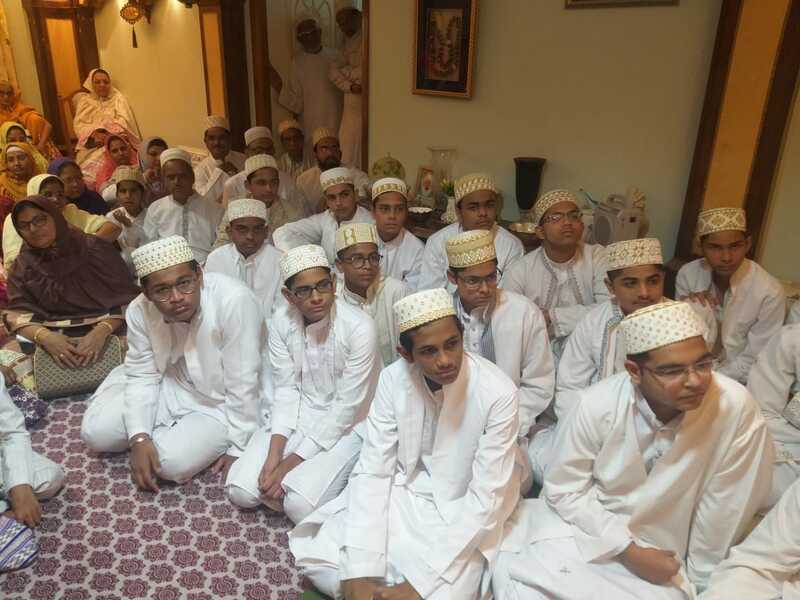 This year, Jadeed (New) Misaaq of Boys and Girls were taken in the Qasr-e-'Aali of Saiyedna Saheb (tus) at Daar us-Salaam. 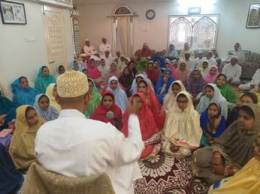 13 Boys and 14 Girls assembled in the Qasr-e-'Aali on 19th Rajab 1435/18th May 2014, Sunday for the Misaaq. 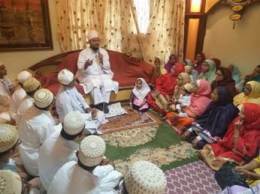 Among the group of Girls, Mazoon ud-Da'wat Haatim ul-Khairaat wa Rabee' ul-Barakaat Haatim Zakiyuddin Saheb (dm) did the Naseehat and Bayaan of Misaaq while Ra's ul-Hudood Zulqarnain Hakeemuddin Saheb (dm) addressed the group of Boys. Along with the Boys and Girls, almost 125 mumineen gathered in the Qasr-e-'Aali. Huzoor-e-'Aali (tus) in his Bayaan after the Misaaq, emphasized mumineen that whatever time may come to you, never leave the Seraat ul-Mustaqeem of Maulaana 'Ali (as) and Saiyedna 'Ali as Shaheed (aq). Rajab ul-Murajjab, the month of Maulaana Ali (as) has the most auspicious days during the ayyaam of his birth in Ka’batullaah, when the majlis of Bay’at is held at the Centre of Da’wah Shareefah. This year witnessed a special occasion at the residence of Da’i uz-Zamaan, the vicegerent of Imaam uz-Zamaan (as), Saiyedna saheb (tus) on the mubaarak day of the ‘Urs Maymoon of 43rd Muqaddas Maulaa Saiyedna Yusuf Nooruddin saheb (aq) 17th Rajab, Sunday, where 31 farzand-dukhtar gave Bay’at to their Maulaa. Parents and the relatives also took fayz-o-barkat of this majlis. Walaayat (worldly and spiritual submission) of the Imaam and his Du’aat is the Supreme obligation above all things in Shari’at and it constitutes the completeness of Imaan. Walaayat is that pillar of Islaam without which no other obligation is acceptable to Allaah Ta’aala. It is the unending divine tradition that has begun before the creation of this world and will remain eternal after the destruction of all the creations. Bay’at is the key to the devotion of Allaah which has changed the fate of all the things. Bay’at to Imaam uz-Zamaan (as) and its compliance has resulted into the merits of mumineen and bestowed with the reward of Paradise. Those who remained disobedient to their Imaam and has broken the relation of allegiance has transformed their fate into the fearful place of Hell-fire. Like every year the majlis of Bay’at-e-Imaam uz-Zamaan (as) took place at Devdi Mubaarak on 21st Rajab ul-Asabb in the morning when parents along with their wards attended this ruhaani function. Mazoon ud-Da’wat presided the majlis while Mukaasir ud-Da’wat and Ra’s ul-Hudood took bay’at of farzand and dukhtar respectively. Mazoon ud-Da’wat in his naseehat reiterated the fact that, the bay’at is the sunnat of Allaah and every Nabi followed it until Rasoolullaah (saws) exalted Maulaa Ali (as) to the status of his vicegerent by taking Bay’at from Ummah Muslemah. By following this sunnat each and every mumin/muminah has to give bay’at to the imaam/da’i in the place of Nabi/Wasi. By offering bay’at one enters into the ambit of Imaan and Walaayat. This is called second birth which is spiritual i.e. Wilaadat-e-Deeniyah. If this doesn’t happen at the age of puberty then the soul remains impure and darkened with ignorance. Angels ascend with du’aa towards Heavens and descend with barakaat (blessings) on the assembly of mumineen, where sunnat (tradition) of Ambiyaa (as) is followed with pure hearts and deep faith. Bay’at-Misaaq given to Imaam uz-Zamaan (as) is one of the traditions which is required for the fulfillment of any obligatory order ordained upon mumineen by the Divine law of Shari’at. Rasoolullaah (saws) said that, “The door to enter my city of knowledge is my Ali, and the door to get my favors is the love for Ali.” The best and true way to reach the magnanimous personality of Maulaana Ali (as) and then to Rasoolullaah (saws) is holding Bay’at of his son (aal) Imaam uz-Zamaan (as). The Misaaq of Imaam uz-Zamaan (AS) is one of the distinguished pillars of strengthening and consolidating the Imaan (faith). According to the Isma'ili – Taiyebi tenets, one cannot recognize Allaah and His Prophets without the cognition (ma'refat) of the Imaam (AS) of his time. And the first step of the cognition of the Imaam (AS) or his Da'i is his permission and obedience that is to give him the covenant. The physical birth of each of us is the result of nature's law but the spiritual and religious birth; the piousness of soul; the ascent of inner self and knowledge does not take place until a child enters the adolescence and gives the covenant to the present Imaam (AS) or his representative and acquires the matter of spirituality, divine knowledge and recognition. Simultaneously, it becomes obligatory upon him to perform both the worship (ibaadat); the worship of knowledge as well as action in accordance with the divine faithfulness. The foundation of which should be based on the Qur'an, the sunnat (practices) of Rasulullaah (SAWS) and wisdom. 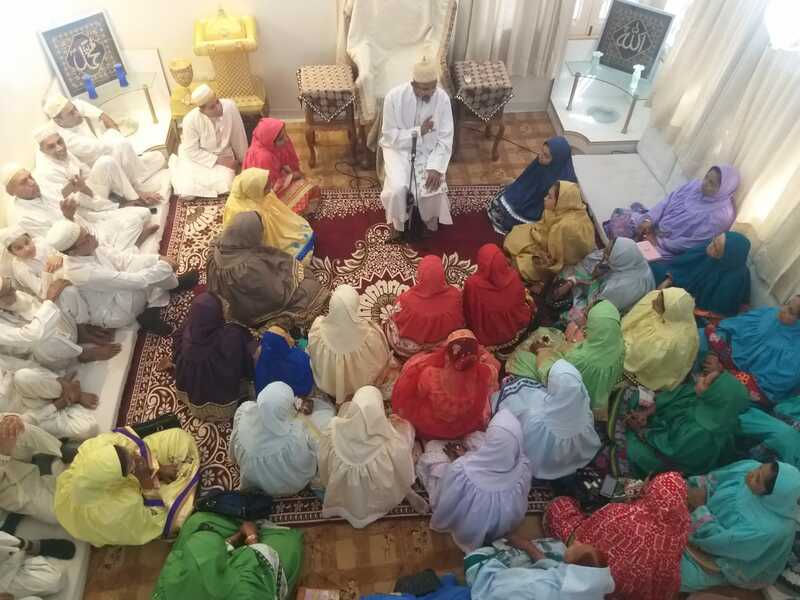 Majlis-e-Misaaq was held under the headship of Mazoon ud-Da'wat Saiyedi Haatim Zakiyuddin saheb (dm) at Devdi Mubaarak where dukhtar-farzand of mumineen mukhleseen who has reached the age of shu'oor and ‘aql i.e. the age of maturity entered into the daayerah of Imaan and gave bay'at to Saaheb-e-Da'wat to adhere to Shari'at-e-Islaam and Mazhab-e-Ahl ul-bayt (as). Mazoon saheb elucidated in length the importance of misaaq and its role in day-to-day affairs for a true faithful throughout his lifetime. A person by birth is Muslim, but when the ma'refat of Imaam uz-Zamaan (as) and the ruh of imaan enter his heart which illuminates it with the ‘ilm and noor of Aal-e-Mohammad (saws), then only he is entitled to be called by the laqab of a mumin. Before this event, the exclusive exam of deeni ma'loomaat was conducted for everyone intending to give the bay'at. Those dukhtar-farzand succeeded in this intihaan were allowed to attend the Majlis-e-Misaaq, else they were directed to prepare for deeni ma'loomaat and learn small Qur'ani Surahs, Wuzoo, Namaaz and give the same before another Majlis-e-Misaaq that is going to be held in Rajab ul-Murajjab. This deeni imtihaan is indeed proving to be extremely fruitful before the misaaq as its helps prepare the basic deeni knowledge and makes its incumbent on the dukhtar-farzand to learn wuzoo-namaaz practically. 23rd Rajab 1431 – 4/7/2010, Sunday was the most auspicious, glittering and memorable day for all 42 farzand & dukhtar (boys & girls) as they gathered with their parents and relatives for their highly important event of their life. This event was their Wilaadat-e-Deeniyah i.e. the birth by Imaan and to act as per the rules, regulations and norms of Deen. Till now they were their physical being like other general people but now they will live physical life with the guidance of spiritual adherence to the Imaam uz-Zamaan (as) through his representative Da’i uz-Zamaan (tus). The event was marked with a delightful distinction when Saiyedna Saheb Huzoor-e-‘Aali (tus) ordered that the majlis of Ahd-e-Awliyaa (as) i.e. Misaaq to be held at Daar us-Salaam. It was for the first time that such function took place at Daar us-Salaam in such a beautiful way after its inauguration 13 yrs ago. Around 200 mumineen and muminaat came to attend this majlis. Some of them came for the first time at Daar us-Salaam and they were very excited as the misaaq of their ward was to take place at such a blissful place surrounded by serenity and ambience of Alavi Shaan. The majlis started with the bayaan of Syedi Mazoon ud-Da’wat Haatim Zakiyuddin saheb (dm) in which he explained each and every aspect of Bay’at. Below are some of the questions which he dealt with Qur’an, Ahaadees and bayaan of A’immat. Why it is compulsory for a mumin to give Bay’at to the Imaam of his time? Why the tradition of Bay’at is there only among the mumineen who believe in Imaam uz-Zamaan (as)? After Bay’at what is compulsory on a mumin and how he should lead his life? How all the Ambiyaa (Prophets) took Bay’at of their ummat? What is the spiritual birth and physical birth? What is the difference between the mother who gives birth and brings up her child in this world and the Imaam or Da’i who nourishes the faith of a mumin with Naseehat and Hidaayat? How the succession of Awliyaa occurred right from Aadam Safiyullaah (as) till the present day? Why is Razaa the heart of all deeds and the core of Da’wat? How and why did Rasoolullaah (saws) appointed Maulaana Ali (as) his vicegerent at Ghadeer-e-Khumm? The majlis culminated with the du’a-e-khaas of Huzoor-e-‘Aali (tus) where our Maulaa said that, “Before this you were only Muslims knowing the obligations of Shari’at, but now you have entered in the city of Imaan, you have become a Mumin where you will know the realities of Shari’at based on the Walaayat of Ahl ul-Bayt (as). You are now my ruhaani children and this Da’wat is your ruhaani family. Be steadfast in maintaining the respect of this family. This is the period of deceitful and false-hearted people i.e. Daur-e-Shaitaani, so protect your imaan and deen. Be aware that there are people who misguide our young blood by falsely relating themselves to Qur’an. Qur’an alone will not suffice us but it is Imaam uz-Zamaan (as) and his Da’i who knows the where’s and how’s of the Qur’an and he will take us on the path of Najaat.” For us both Ali (Maula Ali and Saiyedna Ali) are the epitome of truth and we are their mumin and by their waseelah we always hope of Rehmat from Allaah. The program lasted for 2½ hrs and throughout the ceremony there emanated the only fragrance and that was of devotion and knowledge. The maqaam of Da’iullaah is the doorstep of Walaayat and Knowledge and this program proved that the strongest sense in a mumin is the sense of Imaan and Yaqeen. Bay’at-Misaaq-Ahed is the sunnat of Allaah which began before the creation of this world and will continue till the Day of Judgement. By the izn of Allaah and to enter His da’wat of Imaan His Mursaleen and Awliyaa takes the strict oath from tabe’een mumineen (faithful people). At any given point of time there is one Saheb of nass, ilm and noor who is appointed by the Ta’eed of Haqq (Allaah). A faithful should believe in the oneness of Allaah, prophet-hood of Mursaleen, deputy-ship of Awsiyaa, Imaamat of Imaam uz-Zamaan and itaa’at (obedience) of Naa’ib-e-Imaam (Da’i). He should have faith in all heavenly books, angels, jinnaat, jannat, jahannam, qayaamat, siraat, mizaan, hisaab-e-kitaab, sawaab-o-azaab of qabr, shafaa’at of Ahlul Bayt (as), me’raaj, mo’jizah of Awliyaa etc. He should follow the pillars of Islaam and Imaan i.e. namaaz (prayer), roza (fasting), hajj (pilgrimage to Makkah), jihaad (defence for the protection of deenullaah), tahaarat (purity), zakaat (purity of wealth by the hands of Da’iullaah), walaayat (allegiance to Da’wat), adl (justice), yaqeen (conviction), sabr (patience). After his physical birth (wilaadat-e-tabi’eeyah), a faithful takes deeni-imaani birth (wilaadat-e-deeniyah) by giving bay’at-misaaq to his Imaam uz-Zamaan (as). He was first only a muslim having physical father-mother but after the bay’at he comes into the family of Imaan where the Imaam becomes his ruhaani waaledain (parents) and this bond of imaan will never terminate. Misaaq solely stands on the institution of Imaamat. Imaamat stands on the holy progeny of Wasi (deputy of Nabi) and this in turn depends in the ta’weel (inner meaning of the command of Allaah) of Wasi and tanzeel (the outward revelation of the book of Allaah) of Nabi. So Mohammad Rasoolullah (saws), his wasi Maulaana Ali (as), his progeny from Imaam Hasan (as) till Imaam uz-Zamaan is the fountainhead of our misaaq. Nabi, Wasi, Imaam, Da’i, Mazoon, Mukaasir are only the medium of Misaaq. They are the hujjatullaah and the oath is given to Allaah through them. No one on this earth except them can take the oath of a mumin as they are subjected for the guardianship of Da’watullaah. It is through Misaaq that they guide the jamaa’at of mumineen. They are the shaahid (witness) of the oath of a faithful of which he will questioned in the qabr. A mumin is very much responsible of the promise he gives to Allaah and he should fulfill it in any circumstances and obey His command wholely. A single disobedience to the Imaam-Da’i leads to the nullification of bay’at. Allaah has commanded mumineen to follow and practice what is preached by the Saheb who is in the place of Rasoolullaah (saws). A faithful should always away from Shaitaan, his ill deeds, ill knowledge and ill associates. Shaitaan is an open enemy of a mumin. Nowadays it comes in form of internet, mobile phones, TV, dirty films, wicked friends, impure knowledge etc. A faithful should recognize these things which poses grave danger when dealt carelessly. Every modern equipments bring with it benefits and drawbacks. Make a tendency to use it properly and intelligently. At the age of misaaq a girl should know the whats-hows-wheres of the home. She should take interest in daily chores and should be aware of the happenings of kitchen. The mother should train her daughter on the seerat and surat of Saiyedaat of Ahlul Bayt (as). When she will be married she should know the ins-outs of the imaani home properly. Jadeed Misaaq and Bay'at-e-Imaam uz-Zamaan (as) of the Shabaab of Alavi mumineen was held at Devdi Mubaarekah on 18th of Rajab ul-Asab 1429/20th of July 2008 – Sunday. The ceremony of the Misaaq-e-Jadeed was headed by Saiyedi Maazoon Saheb (dm). Almost 50 dukhtar and farzand of the mumineen who have reached the age of maturity gave Bay’at (covenant) to Saheb-e-Da’wat and the Naa’ib (representative) of Imaam uz-Zamaan (as). Ceremony of Misaaq is core and essence of the ‘Aqaaid of Faatemi Ismaa’ili Taiyebi Muslim community. Misaaq is the spiritual birth of us – supreme and quintessential one by which all our deeds are accepted by Allaah. Misaaq establishes a spiritual connection between us and Imaam uz-Zamaan (as). Allaah Ta’aala took the Misaaq of His Malaa’ekat (Angels) and commanded His Prophets to take the Misaaq of their communities. Misaaq is the command of Allaah Ta’aala, Sunnat of Rasoolullaah (saws) and the Siraat-e-Paak of A’immat-e-Taahereen (as) which was followed by Du’aat ul-Akrameen (aq) and is still followed in the present times and will be followed till the Day of Qayaamat because it is the ceremony of Misaaq which reminds us of the presence of Imaam uz-Zamaan (as) in this world – who is Hujjatullaah and Sibghatullaah (representative and colour of Allaah). Saiyedi Maazoon Saheb (dm) in his Bayaan-e-Faakhir, explained the significance of Misaaq in the life of a Mumin in this World and in the Aakherat. He also gave a historical background of the Misaaq and why it is not been followed in the communities other than Ahl-e-Bawaahir (the Bohras). Mumineen can listen to the excerpts of the Bayaan of Mazoon Saheb (dm) uploaded as the audio file on this page.